Every products price is inclded MVA. In the shopping cart the total amout is written. Payment terms is stated in the shopping cart and may differ depending on the seleted way of payment. Shipping terms is stated in the shopping cart and may vary depending on the chosen way of delivery. you have the right to withdraw your order during a 14 day period. In your message to us it must be stated clearly that you want to return the products. The 14 day period starts from the day you received the parcel. the product because of its state, can not be sold agian by Segebadenpulkan. In general, custom made products may not be sent back. you are obliged to keep the item in the same condition as when you received it. You may not use it, but of course examin it carefully. if the item is damaged orlost because of your handling, you loose your right of withdrawal. We have a 2 year warranty on our products regarding material failure. You need to present a valid receipt. Please contact us for these kind of matters. 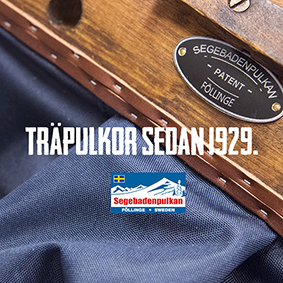 If you have some other type of damage that is not covered by the warranty, we can repair most things in our workshop, even if your pulk is from the middle of the last century! Our ambition is that our products should last for generations so the older generations of pulk we can repair and/or improve. When you place an order you advise us your personal information, at the same time you approve that we store the information and use it in our buisiness to fullfill our obligations towards you. According to Swedish law you have the right to have the infomation we have registered in your name. if it turns out to be incorrect, inclomplete or irrelavant you may demand it to be corrected or removed, please contact us by email in that case. The delivery time may vary depending on both product and shipping distance, on non stocked items we do not garanty a shipping date, if your order contains both stock items and non stock items and you wish to have the stock items delivered directly, please note the order. If not we will send all items once ready. Return of products are on the customers expence, exept if the product is defect or Segebadenpulkan has sent the incorrect product. Returning packages are to be sent post or Courier, in the event of changes a product, we will not charge shipping cost when we send the new product.